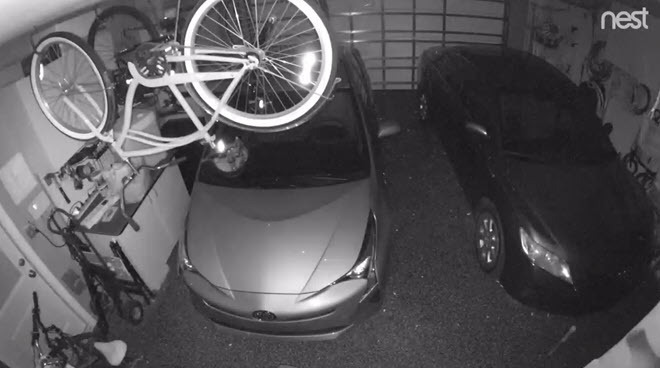 I moved one of the old Dropcam Pros into the garage, replacing the TRENDnet TV-IP572PI, and bought a new Nest Cam Indoor for its original location inside. 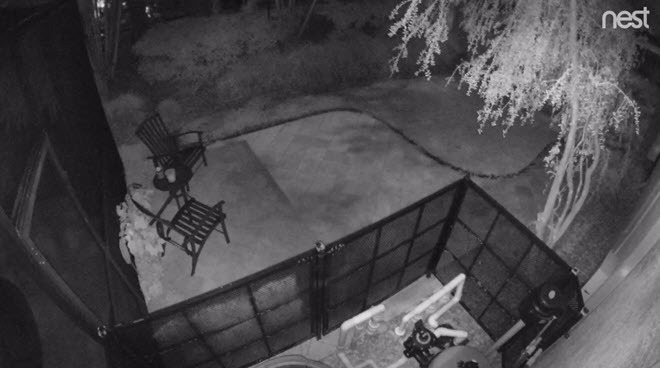 I also bought a 4-pack of the Nest Cam Outdoor (three to replace the TRENDnet domes, and a fourth for a new location watching the driveway). 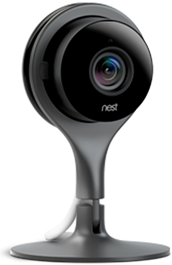 The Nest Cam Indoor (left) looks very similar to its Dropcam predecessors. It’s still black and still inexplicably comes with an off-white USB power cable (although since it’s a basic USB cable you could easily swap it out. The Indoor is not compatible with the old Dropcam power bricks, however (different voltage). The stand is more adjustable with a re-designed hinge near the base and the mounting bracket is magnetic (instead of the plastic snap-in bracket that came with the Dropcam). You can get a white stand, but since the camera is black I feel that it would stand out (no pun intended) more in that housing. 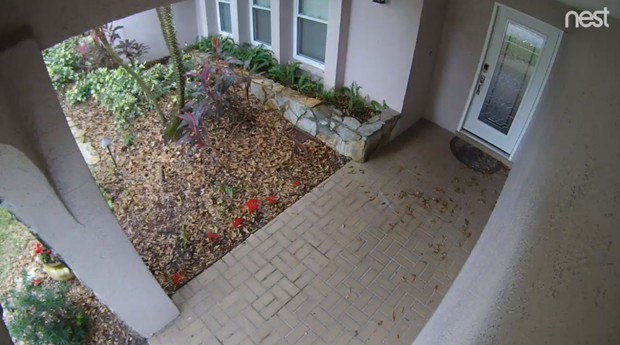 The Nest Cam Outdoor (right) is basically the Indoor camera in a weather-resistant housing. It’s white (with a white cable!) which worked perfectly for my needs but if white doesn’t work for you there are all sorts of colored silicon sleeves from third party vendors on Amazon. Like the Indoor, the mount is magnetic. The 10′ power cable is permanently attached and comes out of the bottom of the camera (which is also where the speaker and microphone are). That cable ends in a standard USB plug that connects to a small, circular power brick. The brick then has a 15′ electrical cord suitable for outdoor outlet use. 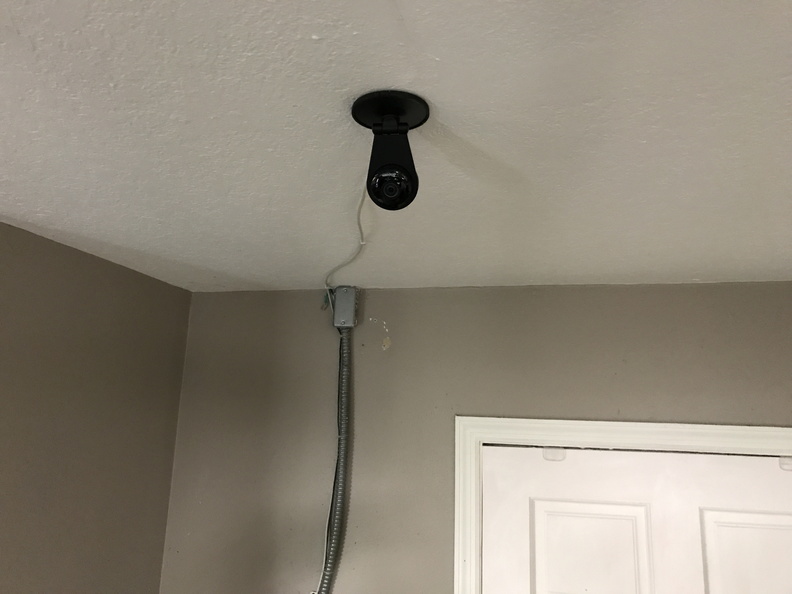 This allows the camera to be installed up to 25′ away from an outlet, but depending on how you have to route the cable, that 25′ can get short quickly. Both cameras can record up to 1920×1080 30fps HD video with audio, have a wide 130º field of view, contain 8 IR LEDs for excellent night vision, and have a speaker you can use to talk through (although it’s not very loud). 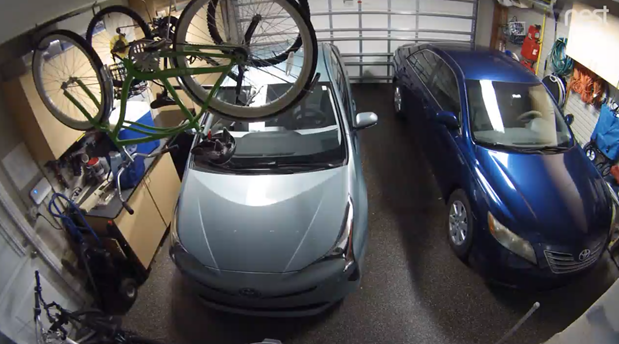 As I mentioned above, I took a Dropcam HD from inside and moved it into the garage, replacing the TRENDnet camera. I mounted the (plastic) bracket on the ceiling, then ran the USB cable to a nearby outlet. Easy enough. 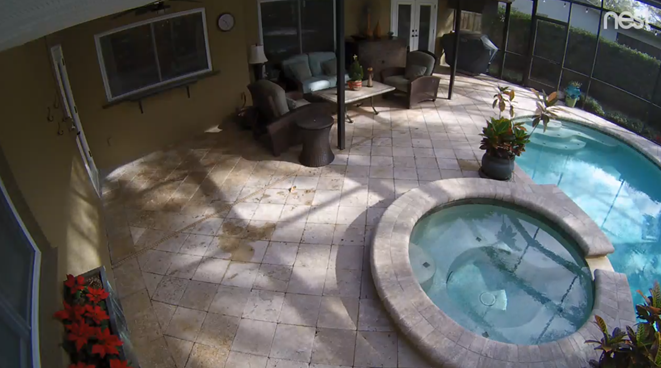 Then I installed the new Nest Cam Indoor in the location vacated by the Dropcam. The magnetic mount is very strong and makes a satisfying snap when the camera is attached to the base. 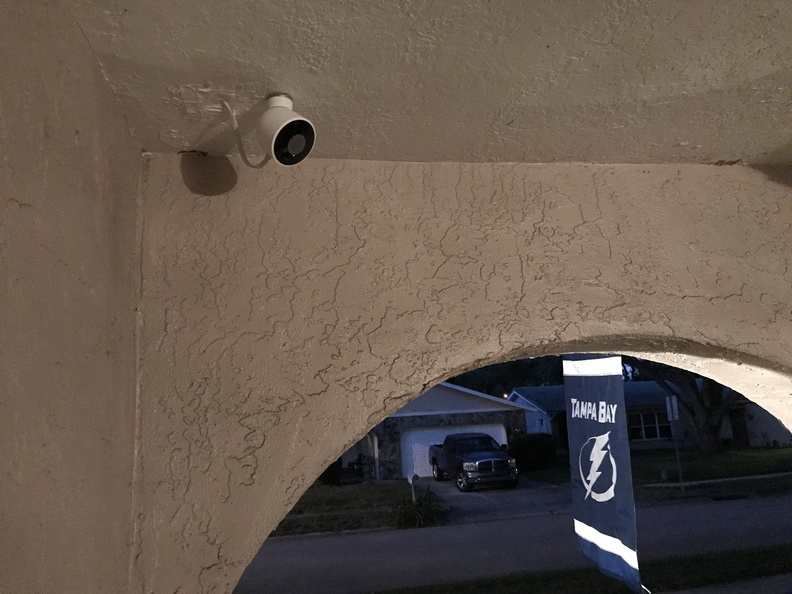 Installing the outdoor cameras was a little more involved as I didn’t have outdoor power outlets near to where I wanted the cameras. But since I was replacing existing PoE cameras I had experience with running cable through my attic and soffits. 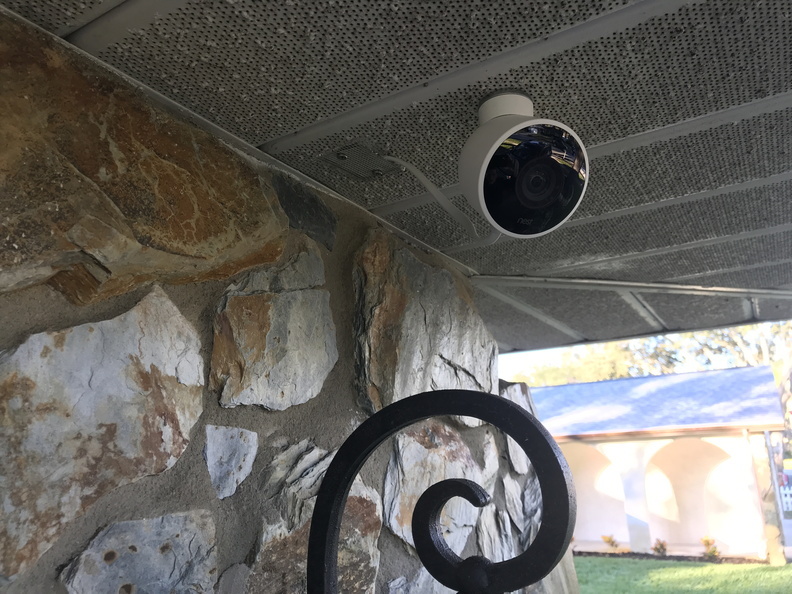 I ended up putting two cameras exactly where the old TRENDnet domes were, but took the opportunity to install the other two in new locations for better coverage. 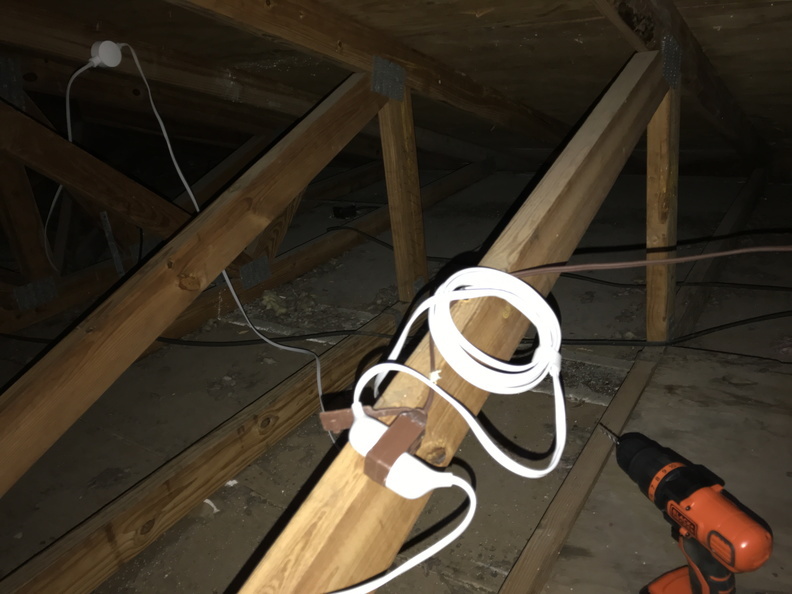 In all four cases, I ran the power cord up into the attic to outlets for power. 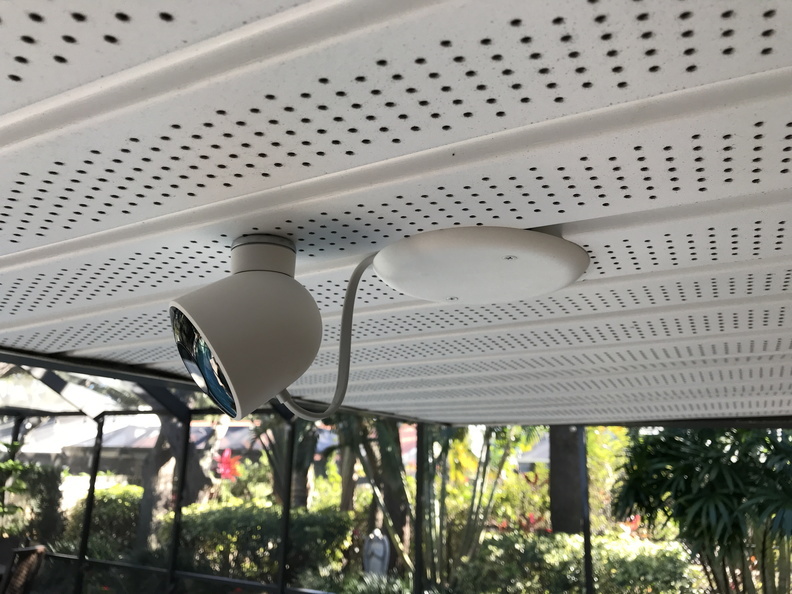 The cameras are pretty light, and the magnetic base is very strong, so I just used the two included screws to attach the metal base to the soffit and then snapped the camera on (time will tell (i.e., hurricane season) how strong that magnetic mount is). Then I drilled a hole in the soffit large enough for the USB end of the power cable to feed through up into the attic. Since the power cable comes out of the bottom of the camera, I had to play with it a bit leaving a little slack before running it up into the attic so there was enough to allow for re-positioning the camera if needed. You can turn the camera over so the cable is on top (and then rotate the video), but then the speaker is also pointing up (which could allow moisture in) and the logo is upside down (I wish they wouldn’t print the Nest logo on the front of the cameras just for this reason). 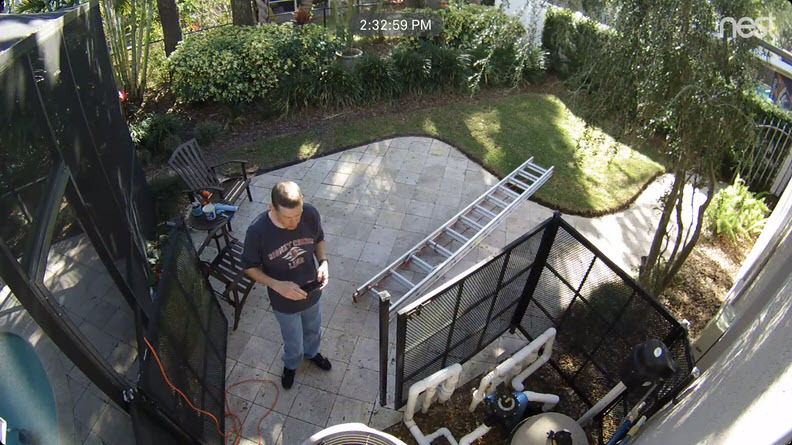 Adding the cameras to my Nest account was easy: click “add product” in the app, scan the QR code on the back of the camera, pick the wireless network (all of my cameras are on a VLAN’ed separate IoT segment), and connect. 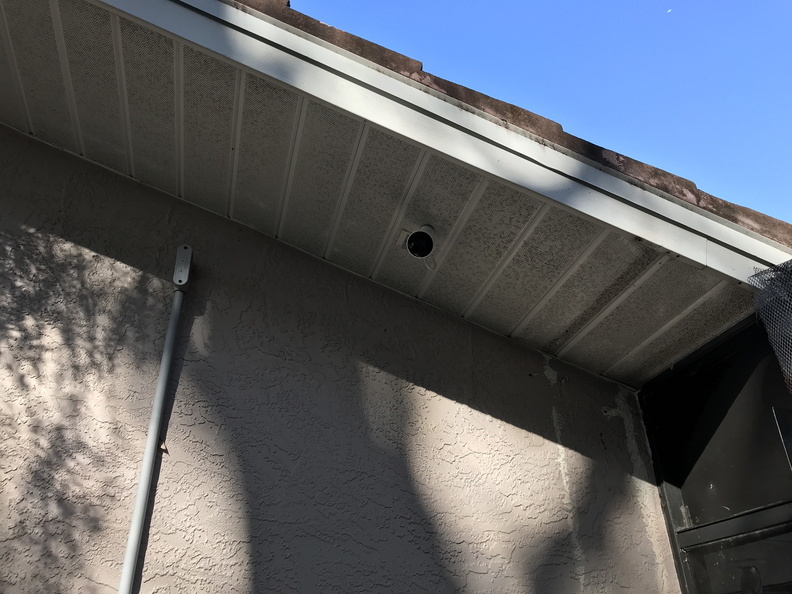 Oh yeah, you need to make sure the location of your outdoor camera is within range of your wireless network (another drawback over the wired PoE TRENDnet domes). I really like the wider-angle view provided by the Nest cameras as compared to the TRENDnet ones as you can see in the images above. And since all of my power connections are hidden up in the attic, someone can’t just come by and unplug them. Of course, they could just knock them down off the magnetic mounts and/or cut the power cord (which is a drawback compared to the dome cameras where everything was hidden up in the attic) but at least theoretically the camera would capture the last thing it saw before losing power. Nest is really going for ease-of-installation over the security of the installation, but I’m okay with that. 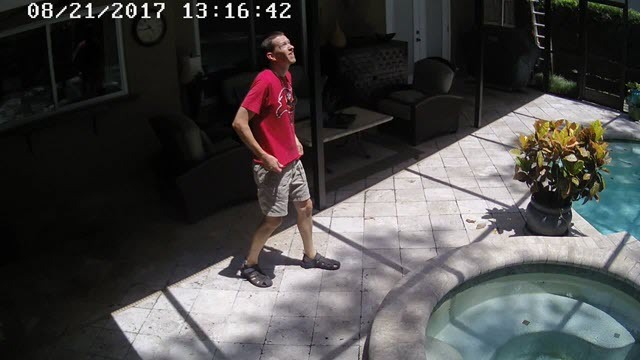 Speaking of security, you can use the Nest mobile app or web site to watch the live feed from your cameras, check on the last three hours of “snapshot history” (images of events), and receive basic motion alerts for free. 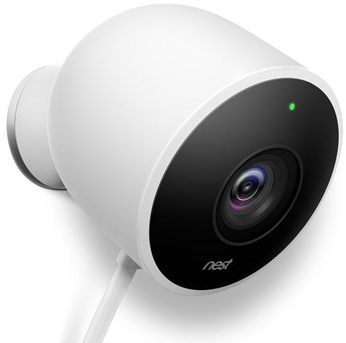 If you want continuous recording and access to history you’ll need to add a Nest Aware subscription to each camera. This is where the Nest solution can get expensive. On my old three Dropcam solution, I had the 10-day annual subscription on all of them, which was $100/yr for the first camera and $50/yr for each additional camera. The TRENDnet domes were recording internally on my Synology NAS using Surveillance Station so they were effectively free. Since I was adding four cameras to my Nest subscription, I decided to drop down to the 5-day annual subscription ($50/yr for the first camera and $30/yr for each additional camera). You don’t need a Nest Aware subscription on every camera, though, and you can mix and match the 5/10/30 day subscriptions (but you only get the discount when you use the same plan on all cameras). In addition to the selected days of video history, your Nest Aware subscription enables advanced features on the cameras such as activity zones, the ability to create/save clips and timelapses, and intelligent motion/person/sound alerts (all accomplished by back-end processing on Nest’s servers). 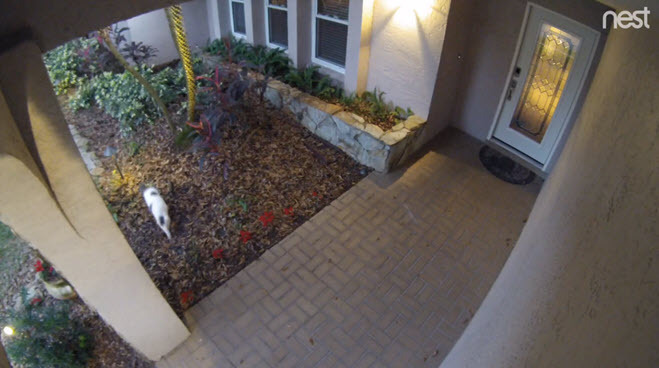 On each camera you can configure the type of notifications you want (push notification or e-mail), when you want them (all the time or when no one is home), and for what (motion, person detected, sound heard, etc). Whereas the outdoor cameras are on all the time, I have the indoor cameras set to only come on when we’re not home. I also turned off the camera status LEDs (I don’t need more blue/green lights around). One option I wish was available would be the ability to have a camera turn on/off on a schedule and when I’m not home. 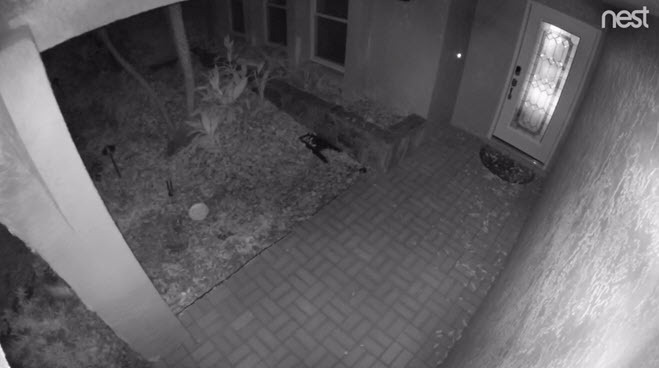 Right now you can only choose one or the other so I can’t have my inside cameras turn on when I’m away and overnight (unless I turn them on manually each night). You’ll also need to make sure you have good upstream bandwidth on your internet connection if you’re going to have a lot of cameras with Nest Aware subscriptions constantly streaming/recording video. 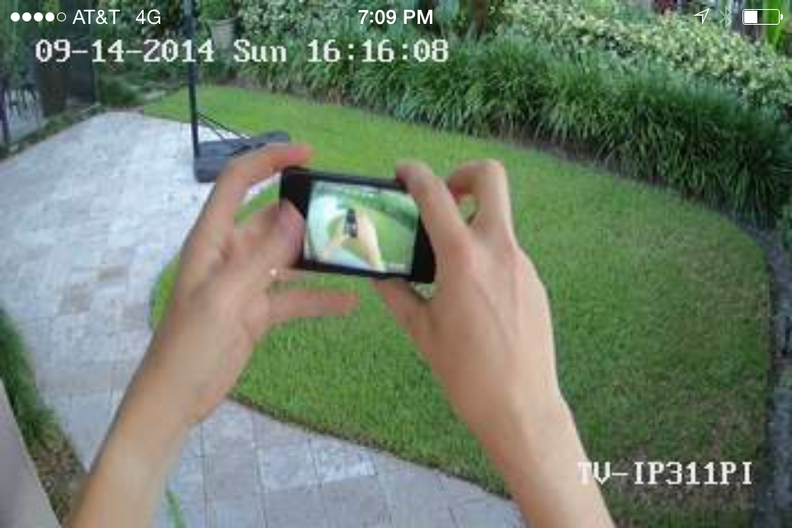 At “medium” (720p) resolution, the Indoor and Outdoor cameras use about 500Kbps. Increasing the setting to “high” (1080p) will bump that to 1200Kbps. I’m using “medium” right now (with a 10Mbps upstream connection) but am going to try switching them all to “high” and monitor the impact. The web site and mobile apps will automatically adjust the quality being streamed from the camera based on your connection speed as well. a rat in the back yard! Overall, I’m very happy with the new setup: eliminating the TRENDnet cameras and Surveillance Station means more free space (and better performance!) on my NAS, and having access to all of the feeds in a single app with the 5-day video history, intelligent alerts, etc. 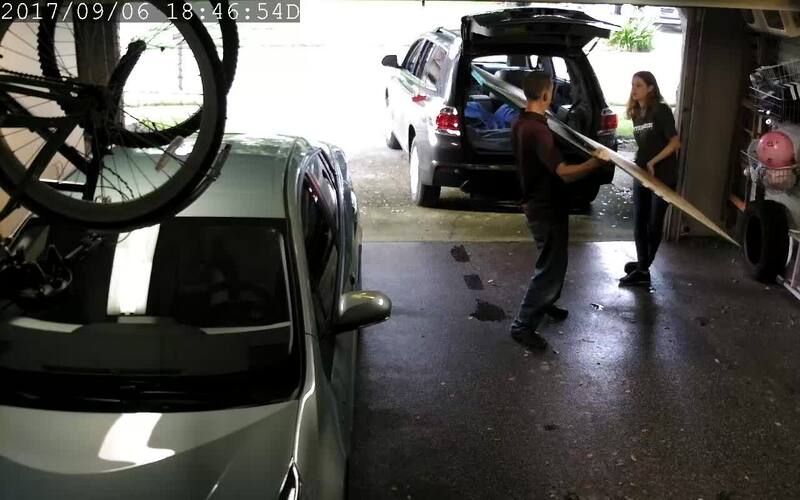 is a definitely improvement to my homebrew security camera setup. Great post. 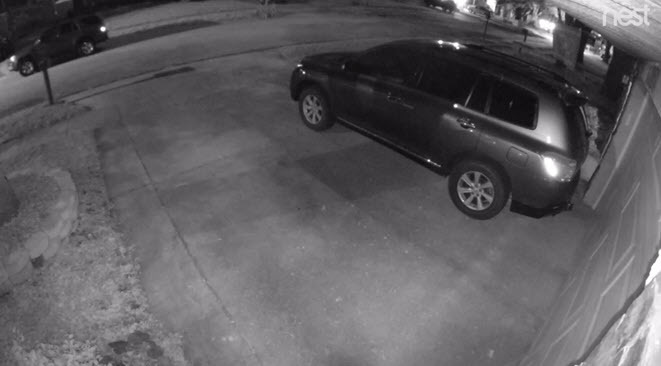 I went with the Ring cameras since I have a Ring doorbell and I especially like the StickUp camera with the optional Solar panel, so no wires to run. 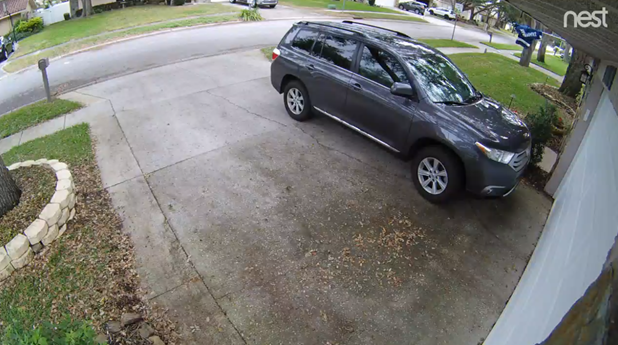 These cameras have motion detection, light activated by the motion and two way audio. I see a lot of Ring doorbells in my neighborhood. 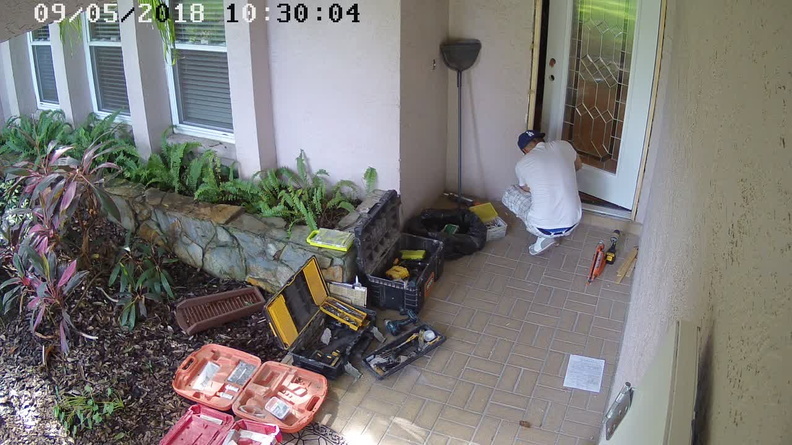 My doorbell is on a side wall instead of the same wall as the door so it wouldn’t face the street though (and I know they have wedges to angle the camera but I didn’t want to have to do that). I didn’t realize the StickUp cameras had a solar option, kinda cool! The Ring Stick Up camera has a spot for two batteries, one comes with the camera. I put an extra battery in each for about $30 and the Solar charger for $40. Get’s expensive but no worry about power.